Twitter is a popular service that helps people deliver real-time mass communications. If you have a blog or website and a Twitter account, why not make it easy for your visitors to follow you? Included in this tutorial is: simple HTML code for your site (html and text file), and two follow images. To use this code on your website, you must place this code immediately following the start <body> tag on every page you wish to display your Twitter follow button. Make sure to backup your WordPress template before making any changes. Upload the follow button images to your site and note the location. After you have uploaded the follow images and have determined the full file path – browse to the wordpress templates folder and find the header.php file of your current blog template. Paste the follow button code immediately following the opening <body> tag. Depending on how you decided to edit your header.php file, either save your changes or upload and replace with your new header.php file. 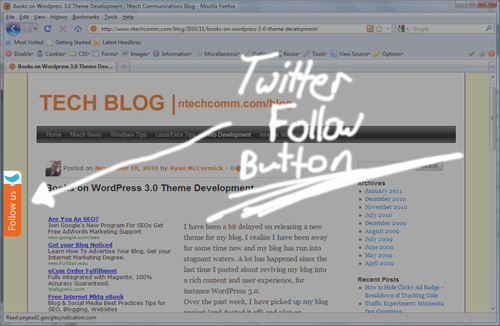 Open your web browser of choice and surf to your blog. If you only see text without an image, double check your image file path settings. If you don’t see anything at all, make sure that your button code has been saved to your template’s header.php file. Please comment with any questions.